This map plays like the skirmish mode we all miss. You play against the Rat and don't expect it to be too easy! This nice and smoothly running skirmish-like scenario is characterized by two main game phases. Phase 1: Economic stabilization going along with defensive efforts to repel the Ratâ€™s increasing attacks. 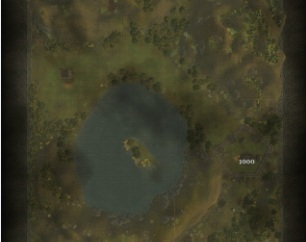 Phase 2: Deployment of troops to conquer the enemyâ€™s stronghold beyond the lake. All these do not cause any major problems, and makes it well-playable even for less-skilled players. Substantially, the offensive and defensive mechanisms do not impede a decent economic development. Nevertheless, the invasions could be slightly tougher or projected from varying directions. So, the enemyâ€™s onslaughts would be set off more incalculable than they actually are. In my opinion, it is a scenario which contains a lot of unexhausted potential; alternating days and nights, some irregularly implemented bad events or a time limit could induce a more challenging game progress. Overall, an impressive creativity is always indicated by a wide variety of aspects which make a scenario perfect. vegetation there is quite meagre. No story - no rating points! What a pity, it might be so easy to create an imaginative story which was about the lake or the Rat and his companions.